Ford design executive Peter Horbury says, Lincoln can be and should be a young persons car. He thinks designs such as the C concept will make the brand more appealing to those younger consumers. DETROIT — The new C concept is a sign that Lincoln wants to get into the small-car business. Any small Lincoln would appeal to upscale urban consumers. The Ford Focus-sized Lincoln C offers "sensible indulgence," said Peter Horbury, Ford Motor Co.'s executive director of design for the Americas, at the auto show here. "This one will open up the possibilities of Lincoln," Horbury told Automotive News. "We're taking the design of Lincoln into new areas and a different sector of the market, which is important. Lincoln can be and should be a young person's car." Lincoln marketers want to lower the age of the brand's average buyer. That average age was 57 at the end of 2008, up from 55 at the end of 2005, spokesman Mark Schirmer said. Although new Lincoln models such as the MKX crossover and MKS sedan have younger buyers than past entries, the average age has risen because sales of the Lincoln Navigator SUV have fallen off dramatically. The Navigator attracts Lincoln's youngest buyers. 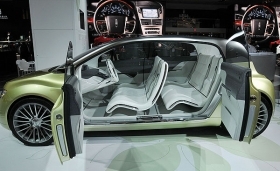 Ford used the next-generation global Focus platform to build the Lincoln C. The concept is the length of the Focus and the width of the larger Lincoln MKZ sedan. Executives aren't saying the Lincoln C will be produced, but they do note that the concept signals serious intentions. Ford product chief Derrick Kuzak has talked about C-segment production possibilities for Lincoln before. Analysts and suppliers expect a compact, Focus-based Lincoln cross-over to be launched in North America around 2011. It is likely to have a companion Ford-brand crossover that would replace the current Escape. The coming Ford crossover is expected to be a version of the next-generation European Ford Kuga.